Agia Pelagia diving center is open from April until end October or mid November. Divers are taken to the diving locations by one of our two diving boats. Daily cruising tours along the North coast of Crete and to "Dia island" are offered with our new specially designed diving boat. 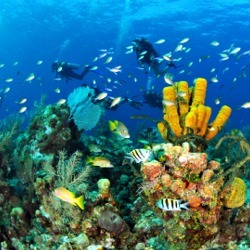 The "House Reef" is offered for scuba diving for beginners (non-divers), inexperienced divers, scuba diving training, advanced scuba diving courses and night dives. Agia Pelagia has a lovely well organized beach and a wide variety of coffee places, restaurants, taverns and bars. There are also a few smaller beaches located nearby and plenty of amenities in the village of Agia Pelagia itself. Excursions to places of interest around Crete Island can be booked at one of the local travel agencies. These include visits to historical museums and archaeological sites, as well as other towns. between 13:30 - 14:30 if they join us for half day and between 16:30 and 17:30 if they join us for the whole day, depending on the place they stay at. Since 1995 DIVER'S CLUB CRETE is located 20 km west from Heraklion city, in Agia Pelagia village, which is one of the most beautiful places for scuba diving in Crete. In April 2007 we moved to our new diving center, which is in the middle of the main beach in Agia Pelagia, just 5 meters away from the sea. The dive center has an easy access and private parking, although the public parking place is just 100 meters away.